Boil potatoes and eggs & keep them aside. Heat oil in a 2 qt. saucepan. Add finely chopped onions and fry them till it becomes golden brown. 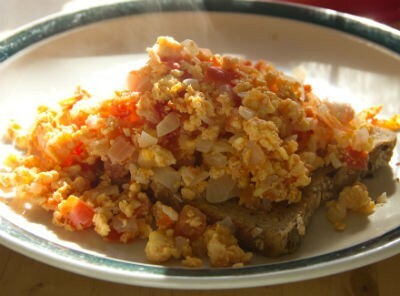 Add finely chopped tomatoes and fry them for 3 minutes (If you are in a hurry, you can use canned tomato). Then add chopped Green Chillies, Red Chilli Powder,Turmeric, Coriander powder, Salt. Cut the Eggs into half. Add Sliced potatoes,Eggs. Then put some water & cook for 2 minutes. Then add whip cream & Garam Masala.Cook for 10 minutes on medium flame. Serve hot with Paratha/Fried rice. Feel free to comment or share your thoughts on this Potato Egg Curry Recipe from Awesome Cuisine.